The other day I was about to watch a Youtube video and for a second I was about to skip what I thought would be another annoying advert. But I didn't skip it and it wasn't an annoying advert, quite the opposite. It was the Dove Choose Beautiful video and I cried. It's some sort of campaign and what they did was put two signs that said average and beautiful above two doors. They did this in 5 different cities: San Francisco, Shanghai, Delhi, London and Sao Paulo. And women had to chose which one to walk through. During the video, different women talk about how they felt about the decision they had made. All the ones that went through the average door regretted it; they didn't see themselves as beautiful at the moment and that's really sad to think about because they are all beautiful. Why can't we all feel like we can walk through the beautiful door? Probably because we compare ourselves to others or because we are told we aren't because we don't fit in the ''beauty standards". Which is really wrong. Here are some experiences from the video: there's a girl with her mum and the girl was about to walk through the average door and her mum pulled her over through the beautiful one. Another says that the beautiful door is out of her league. Another stood in front of both doors and turned another way to not walk through any of them. This infuriated me, you know like it is just not okay at all, they both are beautiful. It's sad that most women feel this way. I could go on about all the women in the video but I'll put it at the end of the post so you can watch it. 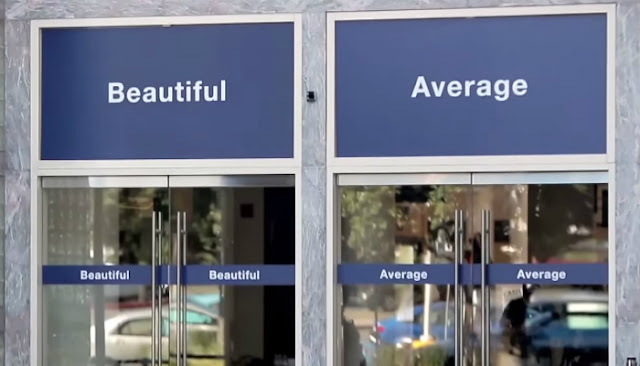 I'm gonna be honest if I was in the position to choose, my first thought would be to walk through the average door as well, it'd be hard to choose the beautiful one. But in the end, I'd like to think I'd end up choosing beautiful. If I think other people are beautiful why shouldn't I think the same about myself? Not gonna lie, for me, it's hard to think that most days because I have very low self-esteem but I know I should think better of myself. A part of me knows that we are all different but equally beautiful individuals and that I do am beautiful no matter what, no matter how I feel about myself sometimes. And this video was a reminder of that. Throughout the video, I thought everyone in it was beautiful, way more than me honestly. So if I was in it, wouldn't people feel the same way I'm feeling right now? What door would you choose? I hadn't heard of this campaign before! But this was really interesting to think about! A lot of us compare ourselves to others when we really shouldn't, because there can't be another you. And people love you for being you. Great post!